Do grandparents let their grandkids get away with stuff their parents won't let them do? Sure. But most grandparents are still pretty good baby sitters, from a safety standpoint (mine were anyway). 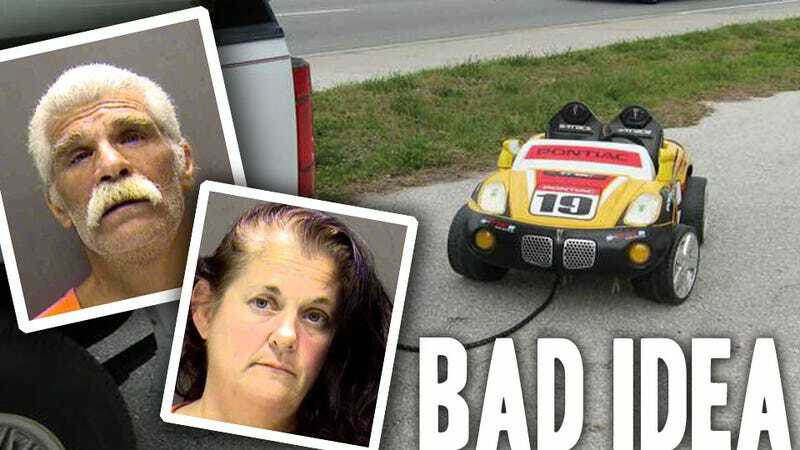 Paul and Belinda Berloni, 49 and 47 respectively, included their 7-year-old granddaughter in their Sunday happy hour plans, which involved driving drunk in their SUV while dragging the tyke behind them in her plastic Power Wheels car. If you're seven and oblivious to the fact that you may end up like the Griswolds' dog, being towed by a couple of dog leashes in a little plastic car behind an SUV is probably pretty fun (it was for me when I was 23, being dragged through the snow behind a truck on a boogie board). But let's face it: it isn't safe. Even thought the Berlonis were going between 5 and 10 mph, they were drunk, and apparently ignoring the physics of what could happen if their 7-year-old darling ended up sliding beneath the high bumper of their Ford Expedition. Even when you're being careful (unlike these boozy grandparents), weird things happen when you can't see what's behind or under your car. Just ask my friend whose niece's head was run over while she was being towed behind a pickup truck in the snow. Not only was he drunk, but Paul Berloni — who already has three DUI convictions under his belt — was driving on a suspended license. Luckily no one was hurt. The two intoxicated grandparents — Belinda Berloni was in the back of the SUV, cheering at her granddaughter through its open rear hatch — and the helmet-less, swimsuit clad little girl were having a grand time until a Sarasota County Sheriff's deputy spotted them from a parallel stretch of road. They must have been a sight; a girl not old enough to know better and a pair of adults too sauced to care.